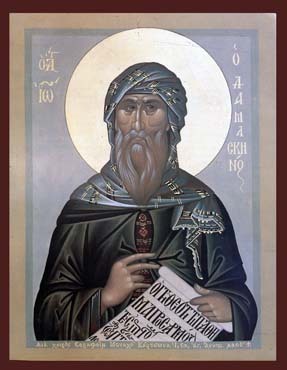 St. John Damascene was born in Damascus in 690 AD. His father was John al-Mansur, a Christian official in the court of the Moslem khalif. St. John was baptized in infancy, and had a tutor called Cosmas who taught he the sciences and theology. Cosmas became a poet and singer, and subsequently accompanied his adopted brother (St. John) to the monastery in which both became monks. In spite of his theological training St. John does not seem, at first, to have contemplated any career except that of his father, to whose office he succeeded. Even at court he was able freely to live a Christian life, and he became remarkable there for his virtues and especially for his humility. Nevertheless, after filling his responsible post for some years, St. John resigned office, and went to be a monk in the lavra of St. Sabbas near Jerusalem. John and Cosmas settled amongst the brethren, and wrote books a composed hymns. Patriarch John V of Jerusalem knew them well by reputation and wished to have them among his clergy. First he took Cosmas and made him bishop of Majuma, and afterwards he ordained John priest and brought him to Jerusalem. St. Cosmas ruled his flock admirably until his death, but St. John soon returned to his monastery. St. John's three letters in defence of the holy icons, for which he was slandered before the khalif and his hand was cut off, had become known and read everywhere, and had earned him the hatred of the persecuting emperors. If his enemies never succeeded in injuring him, it was only because he never crossed the frontier into the Roman empire. After his miraculous healing by the Theotokos, he spent the rest of his life writing many books on theology and poetry at St. Sabbas, where he died around 750 AD. His most famous work is the Exact Exposition of the Orthodox Faith, which is the best summary of the teachings of the early Church Fathers. He also wrote polemical works against various heresies and sermons on feast days. He is renowned as the writer of many feast-day hymns and canons (including the Pascha service), and as the compiler of the Octoechos, whose verses are a summing up of Orthodox teaching.